Branding works because your brain is lazy. If you have ever watched any reality TV survival shows, like survivor, then have witnessed the importance of energy conservation and the impact on human survival. However, times have changed, calories are no longer scarce and we aren’t hunting wild animals anymore.This makes it difficult to imagine the direct link between calories and our own survival in the modern world. So what does this have to do with branding? The answer is relatively complex but I am going to simplify and demonstrate the connection between the brain, effective branding and energy conservation. There are several books that explain how and why branding works but the king of them all has to be “Thinking Fast and Slow” by Daniel Kahneman. In his book Daniel explains, in exhaustive detail, the two systems we use to make decisions. He calls them system one (1) and system two (2). System one is the “fast thinking” part of our brain that our prehistoric ancestors relied upon to make quick fight-or-flight decisions. 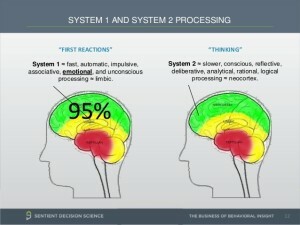 System two is the analytical and deep thinking part of our brains used to solve complex problems. Branding relies upon your fast moving “system one brain” which acts as a gatekeeper for your system two brain (the smarter of the two). Your brain can trick you into making some bad decisions in order to conserve energy. What Daniel Kahneman discovered is that system two uses energy, lots of energy. Have you ever had a long day of exams or spent hours trying to resolve a complex problem and then went home and said “I am exhausted”? That is because thinking (using system two) actually burns calories. In fact chess grand masters in the middle of a tournament will burn 6,000 to 7,000 calories. Obviously most people aren’t chess grand masters, so what is the connection? Be sure to read each of them and observe your thoughts.Your internal response to (A) might be something like “yellow” and your internal response to (B) might be “Should I really try to solve this? What would be the benefit to completing this problem?”. This is an example Daniel uses in his book to illustrate the difference between the two systems and it does a fantastic job of it. Although this does not explain how branding works, it does set the foundation. The secret can be found in your Banana response. System one is quick thinking and is designed to conserve the precious energy needed to operate system two. In order to conserve energy your brain will ask system one if there is a need to activate system two (critical thinking). This is primarily based upon familiarity. If system one can identify something as familiar then your brain may decide that it is “safe” or that it knows the answer you are asking it. The next time you are in the grocery store and you find yourself picking up a name brand product it is most likely due to your lazy system one brain. At one point in your life you made the decision that a certain brand of toothpaste or dish soap is “safe” or “preferred” . Once that decision is made it rarely gets re-evaluated (to conserve energy) and every grocery trip tends to be your system one brain running on autopilot. In our next article, part 2, I will discuss how you can use online branding and system one thinking to increase calls and appointments. Posted by Rstanley & filed under Branding & Advertising.